Spring Break 2016 in Panama City Beach, Florida is just two months away. We know you’ve been saving up for this, and we know you don’t want to come back broke. Going on a Spring Break trip doesn’t have to be an occasion to break the bank. 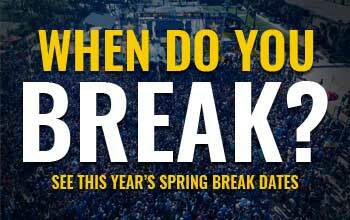 If you’re vigilant about saving money, you can have a great Spring Break, and not come home spring broke. Booking directly with the hotel allows you to cut out the middle-man fee. Most hotels offer the opportunity to book online via their electronic booking agent – so all you really need is a credit card and you’re set! Check out some great hotel options here! Take a realistic look at your finances to determine how much money you can afford to spend. When considering your budget it is important to prepare for the unexpected, so assume everything will cost ten percent more. Gas isn’t cheap, but driving to your destination is much less expensive than flying. If you’re traveling with friends, they can pitch in for gas, making it even less costly for you. If you have to buy common tourist items once you reach your destination you will pay much more than you would have at home. Make a list so you don’t forget stuff like sunglasses, sun block, hat, clothes, sandals, and whatever else you need. Keep your food costs in check. Dining out can be one of the largest expenses on a multi-day vacation. Stop by the grocery store and pick up at least enough food for breakfasts, lunches and snacks to cut down on overpriced restaurant meals. In addition to the coupon-filled brochures in hotel lobbies, most Spring Break destinations offer students a discount party pass which includes free covers/drink specials at bars and clubs plus a wide range of discounts. For example, PCB offers the Panamaniac Club Card.